from 8:30am to 5:00pm pacific time. Any e-mail enquiries will be answered during those times. Most e-mail responses are sent out within 24 business hours. As soon as you finalize an order containing a downloadable product, you will be taken to a page with your personal download urls. Simply click on the link and the file will automatically download for you. An e-mail is also sent to you with the personal download url. Please see our shipping schedule. What's the difference between InnerTalk programs and so-called "subliminal" programs? By definition, a subliminal tape is recorded at a sub-threshold level of awareness. Our messages are recorded at a perceptible level of awareness and disguised in what is best described as an audio illusion. (You will hear words from time to time.) By "blending" the affirmations in with the music or nature sounds in this way, we are able to bypass normal conscious awareness, yet still ensure that the affirmations strongly register in the mind. We recommend listening a minimum of once a day for 30 days. Results can often be noticed in as little as a few days to a few weeks. Listen as much as you can day and night and watch for the change in your self-talk! Why is bypassing conscious attention necessary? Experts have described InnerTalk as a "powerful new technology that uses our natural human ability to absorb information even when we're not thinking about it." Scientists have proven that the key to changing our state of mind is to do it with the least amount of conscious effort possible. Conscious thought interferes with and even prevents proper mind stimulation. Yet InnerTalk® programs are able to produce life-changing mind stimulation without the interference of conscious thought. They bypass the usual resistance in the mind and go right to work at the subconscious level, producing change "from the inside out." How did InnerTalk technology develop? Early research by Eldon Taylor and others proved that auditory stimulation is one of the most effective ways to change a state of mind. Eldon Taylor theorized that by using verbal stimuli just below the threshold of awareness, he could have a positive effect on the moods and behavior of the listeners. His theories were proven correct and thus was born the InnerTalk method. What role does the subconscious mind play? Eldon Taylor's programs are effective because they permit positive messages to reach the subconscious mind, where they can produce positive results without conscious resistance. This is important because the human subconscious is indiscriminate with the information it accepts over a lifetime. All the statements we have ever accepted are present in our subconscious minds, and for most of us that is negative programming. So an individual's current behavior is based on all the information their subconscious has decided to accept over the years. To change current behavior, you first have to change the information stored in the subconscious. It sounds easy, but you can't just tell your subconscious to think differently and ask for life-changing behavior modification. You must find a way to counteract those subconscious thoughts and introduce different thoughts for your subconscious to use. The InnerTalk method will help you control the introduction of stimuli to the subconscious and therefore control behavior modification. Do other methods work just as well? There are other methods available to modify your behavior without the use of mind technologies, but they often fail, and all for the same reason. Most motivational and self-help programs fall short because they attempt to appeal to the conscious in order to change behavior. It's often wasted energy. The conscious wants to change, but it's the subconscious that is controlling and overwhelming any effort to change. Every time someone tells us we are good our subconscious sends a thought to the conscious: "Really! Good at what?" In order to conquer the harmful effects of the subconscious mind we must attempt to change it on the very same level. Only then can you successfully disarm it and reverse the damage that has already been done. The positive InnerTalk messages overtake the negative information contained in the subconscious. They literally re-script our own "inner talk," thereby creating positive self-beliefs that begin the cycle of self-fulfillment. When this happens the subliminal beliefs that formerly were self-limiting begin to change. As they change, so do we! What are the principles behind InnerTalk? The powerful results may seem like magic, but the principles behind the programs are pure science. As you know, the human brain is composed of two halves or hemispheres, the left-brain and the right-brain. These two hemispheres work together or independently to help process information and control our bodies. The left-brain is most commonly referred to as the "analytical brain" and is thought to control such things as mathematical and language skills, organization, logic, reason, observation and analysis. The left hemisphere also includes defense mechanisms such as rationalization built around logic and reason. The right-brain is also known as the "spatial brain." It is thought to be responsible for creativity, emotions, athletic ability, intuitiveness, relaxation and visualization. Many scientists believe the right hemisphere is associated with emotional and subconscious learning. How do InnerTalk programs actually work? The InnerTalk mind technology is unique in that it appeals to both hemispheres of the brain, according to their function, to achieve "whole brain" stimulation. For example, it is believed that the left brain views language literally and according to the rules of language while the right brain views language spatially and emotionally, tumbling the words in a process called subconscious cerebration and even seeing the words as our eyes see the world—upside down. The brain halves work together to understand language both spatially and literally. The InnerTalk technology has been specifically designed to involve both the left and right brain according to their unique specialties using an entirely new and patented electronic encoding process. What is this encoding process all about? On one channel, accessing the left brain, meaningfully spoken, permissive affirmations (such as, "It's OK to succeed. It's OK to do well.") are delivered. On a second channel, accessing the right brain, directive messages (such as, "I am good. I succeed. I do well.") are delivered in reverse, to be recognized by the right brain's unique spatial understanding. The channel-differentiated messages shadow each other from conscious recognition. But on the subconscious level, where the perception takes place, the mind understands and receives these affirmations. The analytical left hemisphere cannot argue with the permissive "It's OK" statements and the non-analytical right hemisphere simply accepts the directive "I am" statements. What Other Techniques Are Used? Most affirmations are delivered in a round robin manner by a male voice, a female voice and a child's voice. Research has shown that individuals may respond more favorably according to their preference of male, female or child voices. Research also has shown that an individual is more likely to remember a round robin like "Row, row, row your boat" rather than a simple song, even if the song is heard many more times. The round robin affirmations are recorded in echo-reverberation giving rise to a "singing" effect. The affirmations are of a positive nature and are electronically synchronized with the volume level of the primary audio track (music or nature sounds) to ensure that your subconscious perceives entire message. No other mind technology compares to InnerTalk, which has been patented with the U.S. Government and scientifically proven effective in leading universities around the world. Some Programs Are Also Available In Other Technologies Besides InnerTalk. Which Technologies Should I Choose? With any of our programs, the more you use them, the better the results. Technologies should therefore be chosen according to your lifestyle. Also, great results have been reported using the different technologies at the same time. For this reason, we have put together multi-tape collections and albums of complementary titles and technologies, available at great savings! Why do some of your programs include statements about a higher power and the divine? Are these programs religious? Many of our programs include a spiritual component. We offer a variety of spiritual programs. We believe the spiritual component of life to be as important, if not more so, than any other component. However, we do not wish to choose the spiritual path for anyone. That is each of our rights, both under God and our Constitution. We, therefore, try to provide a variety of spiritual programs in an attempt to bring something for everyone. We recognize that this is difficult to do while not offending anyone. Nevertheless, we find it a responsibility to use our technology in the spirit of the saying, "As a man thinketh, so is he." Many religious leaders use and have endorsed our programs. Still, if you have a question, please ask your spiritual advisor to review the affirmations in order to insure that the program you choose is in keeping with your particular spiritual path. There is one common denominator in all our programs: forgiveness. It is our conviction whether in school violence or matters of government; it is never okay to get even. 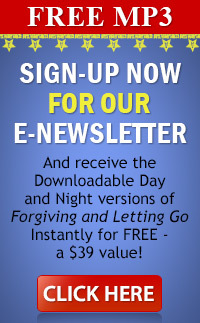 We believe it is so important that we offer our Forgiving and Letting Go program free of charge to those who ask for it. I received my last order very promptly. The programs were shrink wrapped together. Why don't you shrink-wrap all the programs individually? The programs are shrink wrapped together for shipping. This eliminates damage. Individual programs can be shrink wrapped at no charge by simply asking for it. We do not shrink-wrap, unless requested, simply because the material is not environmentally friendly. Indeed, duplicators must be instructed not to shrink-wrap and there is no cost break by not wrapping. It's all about our planet. I just received one of your Dual InnerTalk CD sets. It does not mention how it is to be used. Should I listen to it daily? When should I expect to see results? Listen a minimum of one hour per day. Listen initially for thirty days. Most people will notice changes or see results in the first two weeks. However, people are different. Some people may notice changes in the first few days, others may take longer. Our 2 CD sets were created for maximum use and enjoyment, one tape with a music soundtrack and the other with a nature soundtrack. During the day, surround yourself with the uplifting music. At night, sleep to the soothing ocean. The ocean soundtrack is also ideal in the background while you work or watch television. How can I find the affirmations for a particular title? Sample affirmations are available in our shopping cart. The samples are listed with the product description. Each product we sell comes with the complete affirmations printed on a small card or on the CD cover. I used to be able to listen to several different soundtrack samples and now I'm unable to find them. Where did they go? We used to offer a variety of soundtracks on every title. This led to a lot of confusion and increased our inventory requirements substantially. We carefully analyzed our sales and decided to offer a choice between nature and music, so that you could select one for evening or background play such as when watching television and another for driving or background music. We used our most popular soundtracks and hope you enjoy them. Since our business is "change," we simply couldn't continue to try and deliver music that fit everyone's preference. We hope you understand. Thank you. You have similar instances of products ending with different terms. Accelerated Learning & Study ends with "-- InnerTalk, " " -Echo-Tech " and " -OZO. " I need an explanation as to what those ending terms mean. This question is asked frequently. InnerTalk is our original, patented and proven subliminal technology. This utilizes a set of positive affirmations masked behind a music or nature sound track. You will not consciously hear the affirmations... all you will hear are the music or nature sounds. Echo-Tech and OZO both utilize the same InnerTalk technology, however they also include an audible version of the affirmations... Echo-Tech is the more supportive verbal coaching and OZO contains more authoritative coaching. Mixed in with this are a combination of 3-d sounds, tones and echo effects that stimulate positive and highly receptive brain states. These programs do require listening with headphones. For further explanation of our different thought modification technologies, please refer to our Technology Guide. Can I import InnerTalk CDs to my i-Pod or MP3 player? Remember, your InnerTalk programs are for personal use only. According to international copyright laws, sharing, copying, broadcasting to a large audience or any other such use, may be criminal. For personal use only then, yes you can transfer InnerTalk programs to your i-Pod, Smart Phone, i-Pad etc, but care needs to be taken to ensure no loss in quality. For complete instructions on importing InnerTalk programs to your i-pod or MP3 player, please click here.